Inequalities can be graphed simultaneously on one coordinate plane by overlapping their solution sets. 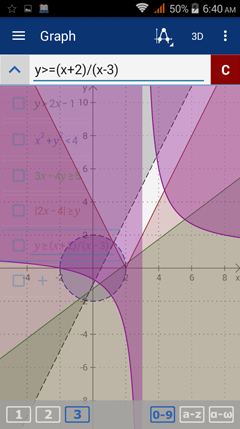 Sketch the graph of each inequality on the same coordinate system. Enter all of the expressions on the same graph. Type the greater than sign ( > ) by tapping the closed parentheses " ) " three times, and type the less than sign ( < ) by tapping the open parentheses " ( " three times. Use a greater than or equal to sign > by typing " >=" and a less than or equal to sign < by typing " <= ".